Leicestershire Airguns - Terms and conditions. Air pistols and air rifles for sale in Leicestershire. 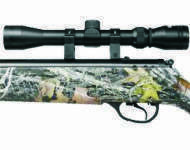 Leicestershire Airguns order your new airgun online. Collect from us on a Thursday, Friday and Saturday in Queniborough, Leicestershire. Payment is by cash or card. Payment by cheque or bank transfer can be arranged but the funds must have cleared before any goods can be collected. You can e-mail us.. phil@leicestershire-airguns.co.uk or phone... 07719787079. Airguns, silencers and pellets are available to persons over 18 only, We will request photo ID if you are 25 or under. We will offer to repair or replace any faulty item within the warrenty period. Please contact us before returning any goods, they may need to be directed to the manufacture for inspection or repair. 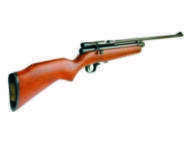 Any air gun that develops a fault may have to be sent to the manufactures or returned to us in Queniborough. Sorry we cannot collect from you. Personal data is held under the terms of the Data Protection Act. We do not disclose buyers' information to third parties. Phone numbers, e-mail addresses etc. are used for the order of your new airgun only. Estimated timescales are specified on the website. We make every effort to supply goods within the estimated timescales, however delays are occasionally inevitable due to unforeseen factors. Leicestershire Airguns shall be under no liability for any delay or failure to deliver the products within estimated timescales. Risk of loss and damage of products passes to you on the date when the products are collected. Title to any products you order on this website shall pass to you on collection of the products provided we have received payment in full for the products. If yours goods are faulty upon receipt please contact us within 48 hours. We will advise you on where the goods should be returned, they may need to go directly to the manufacturers or distributors. If the goods develop a fault after this time the cost of returning the goods is the customers but may be covered by us at our discretion. Failure to notify us within 48 hours from the time of collection will be taken as acceptance of the goods. Any e-mail or other electronic acknowledgement by us of receipt of an order placed by you does not constitute legal acceptance by Leicestershire Airguns of your order. All orders are subject to approval by us. You have a right to cancel your order for any item not purchased in store under the The Consumer Contracts (Information, Cancellation and Additional Charges) Regulations 2013. This does not apply to items that are made to order. If we do accept the cancellation for any item made to order and the manufacture of the item has begun any costs incurred up to the full value of the product will be passed on to the customer. To cancel you can email us, or write to us, quoting your order number. You must take reasonable care of any items AND MUST NOT USE THEM. The return costs for any item being returned is at the customers expense and you agree to this by placing an order. You may cancel your order at any time up to the end of the fourteenth (14th) day from the date you receive for goods supplied other than in store PROVIDED THAT the goods remain unused, unopened and sealed in their original packaging and in a condition suitable for re-sale. The sum paid to us will be credited to you within 14 days of your return of the goods (not purchased in store) provided the they have been returned in an unused condition. The goods in question must be returned to us within 14 days of your cancellation notice and must be received by us in the condition they were in when delivered to you, unused, unopened and sealed in their original packaging in a condition suitable for re-sale. We can not be held responsible for any damage whilst in transit so please make sure this is covered by your chosen carrier. We shall be entitled to recover any direct costs of having to recover the goods from you and may set such costs off against the amount to be credited to you. We have reason to believe that you will fail to pay for the goods or that you will not comply with these terms. Unless we notify you otherwise, once your order has been accepted, we will deliver the goods ordered by you within 7 days to the address you give us at the time you make your order. Leicestershire Airguns will use reasonable endeavours to verify the accuracy of any information on the site but makes no representation or warranty of any kind express or implied statutory or otherwise regarding the contents or availability of the site or that it will be timely or error-free, that defects will be corrected, or that the site or the server that makes it available are free of viruses or bugs or represents the full functionality, accuracy, reliability of the website. Leicestershire Airguns will not be responsible or liable to you for any loss of content or material uploaded or transmitted through the website and Leicestershire Airguns accepts no liability of any kind for any loss or damage from action taken or taken in reliance on material or information contained on the site. Notwithstanding the above Leicestershire Airguns aggregate liability (whether in contract, tort or otherwise) for loss or damage shall in any event be limited to a sum equal to the amount paid or payable by you for the product(s) in respect of one incident or series of incidents attributable to the same clause. We have selected our products on the basis that they will be used for private use only, if you are planning to use them for business or professional purposes please make sure that you are covered by appropriate insurance. Leicestershire Airguns shall be under no liability for any delay or failure to deliver products or otherwise perform any obligation as specified in these terms and conditions if the same is wholly or partly caused whether directly or indirectly by circumstances beyond its reasonable control. We provide the widest choice of air pistols and rifles. site map Copyright © 20012 leicestershire-airguns.co.uk. All rights reserved. 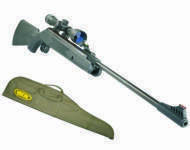 airgun dealers in Leicestershire, air gun shops in leicester. 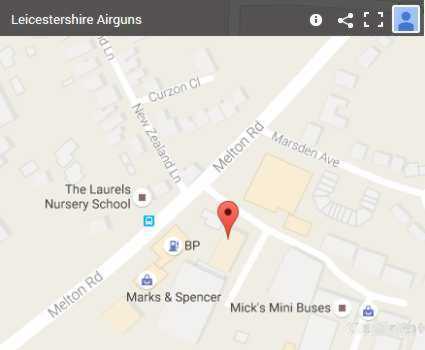 So now you know where to buy airguns in Leicester and Leicestershire.